Another month, another round of Secret Recipe Club…another WINNER! Why has the urge to make enchiladas packed with vegetables not struck me til now? Shame, shame. Perhaps it’s because enchiladas need some “body” (i.e. texture) to them. I tried spinach enchiladas once, and the texture was just…off-putting. Meals aren’t just about flavor…the whole thing has to come together just right. And that is exactly what happened here. Just…rightness (yes, I know that’s not a word!). When I’m assigned a blog to pick a recipe from, where do I begin? Well, if the blog has a search option, I usually search the terms “favorite” or “best ever”. This generally turns up some pretty killer options. But Nicole’s blog, I’m A Honey Bee stumped me. I had a hard time choosing. I’m not new to Nicole’s blog (you should really check it out! ), and I know she enjoys meatless meals, too. So I opted to go that route. Plus, this was a recipe she had chosen from another blog for a round of the Secret Recipe Club and I am yet to have anything sub-par from The America’s Test Kitchen Healthy Family Cookbook. This recipe is perfectly timed with the summer produce that will become bountiful and at its best here within the coming months. When your produce bin is over-stuffed with sweet corn, zucchini, and bell peppers…this recipe is your answer. Of course you can swap in whatever veggie combo your little heart desires. And for those who are yet to tackle enchiladas without the use of canned sauce, bookmark this enchilada sauce recipe. I was a bit weary because it seemed…too easy. I’ve made enchilada sauces before that require either a blender, immersion blender, or food processor (which is fine, but less is always more when it comes to dishes and time! 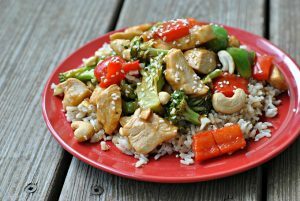 )…but this recipe offered up a short ingredient list with every day ingredients and spices, coming together in no time. As for the flavor? It definitely made these enchiladas what they are. Lastly, let’s talk tortillas. I often buy the corn tortillas that are super thin and come in a big ‘ol stack for super cheap. They taste great, they’re lower in calories, and they work really well for quesadillas, tacos, etc. But if you’re talking about needing to roll tortillas and limit the breakage, I finally found a tortilla that works well without any finesse at all. La Tortilla Factory has some handmade corn tortillas that were out of this world. They’re thicker and much more durable than your average corn tortilla. While the calorie count is a bit higher with this option, they’re worth it. I found mine at Meijer (Kroger did not carry them near me). I was going to make the portion size 2 enchiladas…but I just couldn’t stop at 2. Three enchiladas it is! To make the sauce, heat the oil in a saucepan over medium-high heat. Add the onion and cook until softened and lightly browned, approximately 5 minutes. Add the garlic, chili powder, cumin, and sugar; cook just until fragrant, about 30 seconds. Whisk in the tomato sauce and water, bring to a simmer and cook until slightly thickened, about 5 minutes. To make the filling, add oil to a large skillet and heat over medium-high heat until shimmering. Add the onion and corn, and cook until slightly softened, 3-5 minutes. Add the bell pepper, cook until softened, approximately for 2-3 minutes. Add the zucchini and cook just until tender, 3-5 minutes more. Add in the garlic and black beans and cook until warmed through, about 2 minutes. Transfer the veggie mixture to a large bowl and stir in 1/2 cup of the enchilada sauce, cilantro, and green chilies. Preheat the oven to 450 F. Spread about 1/4 cup enchilada sauce around the bottom of a 9 x 13-inch baking dish that has been sprayed with non-stick cooking spray. Place 1/3 cup of the filling mixture down the center of a tortilla. Tightly roll up the tortilla and place in baking dish, seam side down. Repeat with the remaining filling and tortillas. Evenly pour the remaining sauce over the enchiladas. Sprinkle the shredded cheddar over the top of the sauce. Cover with foil and bake until the enchiladas are heated through, about 10 minutes. Remove the foil and continue to bake until the cheese is melted, 3-5 minutes more. Serve immediately. 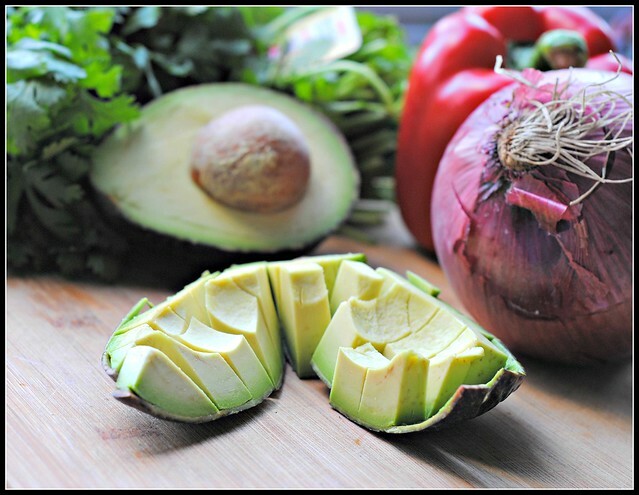 Note: These are great topped with diced avocado and fresh cilantro…mm! Yield: 4 servings (3 enchiladas each). Result: Absolutely delicious! 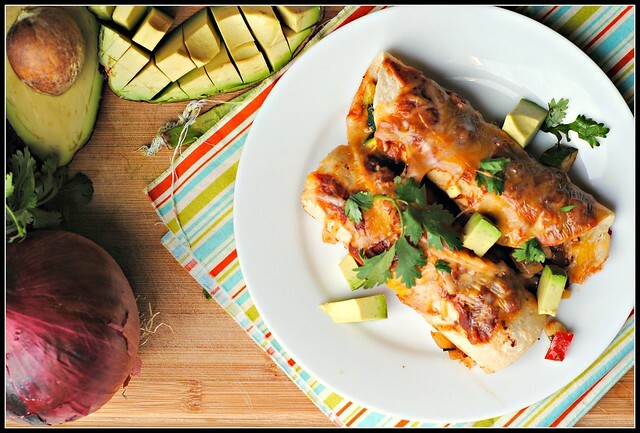 Don’t be a fool like me and think enchiladas stuffed with veggies won’t live up to a chicken or beef enchilada…these are phenomenal! As noted above, the enchilada sauce is so flavorful and truly makes this dish. These aren’t a real quick meal, but you could do all of the prep ahead of time and easily make this a weekday meal. Enjoy! Sad it’s Monday…but no regrets. This weekend was fun, productive, and very relaxing. 🙂 I even planted my garden: Cherokee purple heirloom tomatoes, Early Girl tomatoes, zucchini, chives, basil, parsley, and rosemary. My oregano, sage, thyme, and blueberry bush are all doing well from last year. This week looks wet, hot, and steamy…should be good for my potted garden! I’m so pumped that I found your blog through the SRC… I’m loving everything I see! These enchiladas look SO good I can’t wait to try them! Oh man, this looks to die for. Sometimes Mexican food is the only thing that hits the spot! YUM! These look so yummy! I’m visiting from Group D, and love what you did this month! Beautiful (AND delicious, I’m sure)! 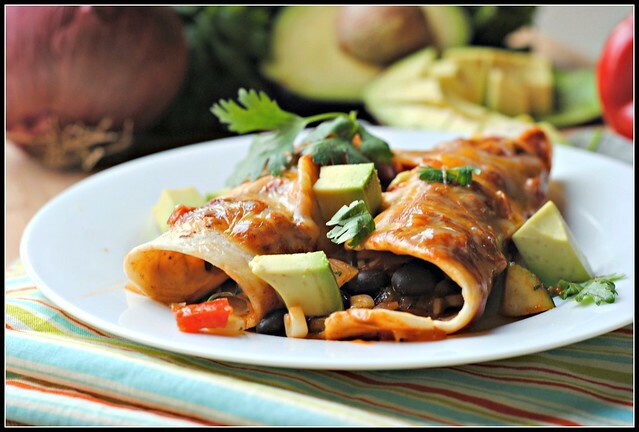 A good veggie enchilada is hard to beat! 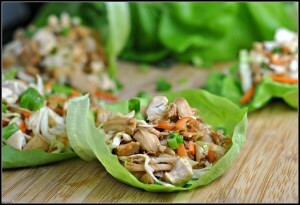 Yep, these are going on my lunch menu next week for me and my SIL. Hope you had an awesome weekend Nicole! Speaking of spinach, as much as I enjoy it, it should not go into mexican food. I ordered the spinach quesadillas once from a restaurant I LOVE and think it was the worst mexican dish I’ve ever experienced. Sadness. 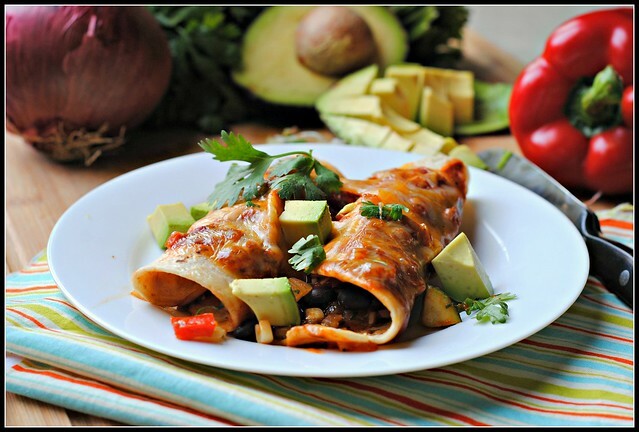 These look really good-I love veggie enchiladas! Visiting from Group D and I’m always looking for new vegetarian recipes! Your photos are beautiful and the recipe sound delish! I am always looking for new recipe for enchiladas. I have done just cheese and it’s not enough. This looks fantastic. These look amazing! Love that there is a recipe for the enchilada sauce…I’ve never seen the canned kind in Toronto. I’ve also never seen corn tortillas in the regular grocery stores too….I’ve actually bookmarked this recipe from Annie’s Eats a long time ago. going to give it a try! Great pick for SRC! Your photos are stunning! I can’t wait to try these! I’ve had these bookmarked for a while but haven’t had the chance to make them yet. I really need to get on it, they look awesome and now I’ve heard yet another ringing endorsement! 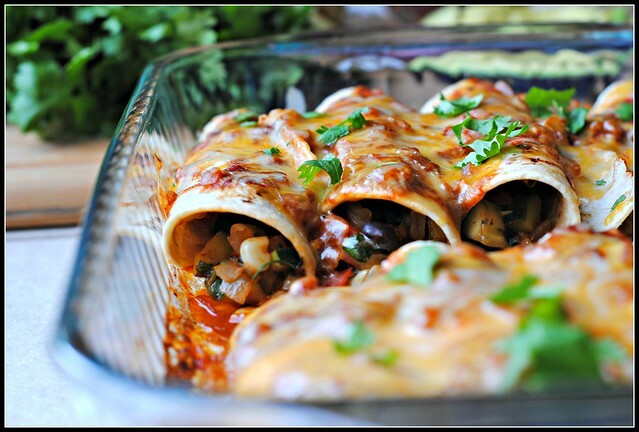 Yum, I have always had a hard time with enchiladas for some reason, but I am going to have to try these! Especially if the sauce is as good as you say! Great SRC post! Those look perfect for Cinco de Mayo! yum! i agree with gretchen – the timing of these is perfect for 5 de mayo coming up. will definitely be trying these soon! also: how much do i love that you made a recipe not just from your assigned blog, but chose a meatless recipe based on the fact that your assigned blogger has a meatless preference? It really captures the essence of her blog 🙂 well done! These look DIVINE!! I’m bookmarking this right now — I have a CSA for the summer and know I’ll be looking for ways to use up all that produce! Nothing better than a good veggie enchilada! These look delicious! Congrats on the Top 9! These look incredible!! Fantastic photos too. Love it!! 🙂 Thanks for sharing! These look phenomenal!! Congrats on the Top 9! Gorgeous photos. I love veggie enchiladas. I made these last night cause the picture looked so good! They were awesome! Made them filled with broccoli and mushrooms cause i didn’t have the other veggies, it proofs that you can fill them with anything. It’s a new favorite at our house! Thanks for the recipe! SAVED! They are beautiful–your photography is STUNNING! This is going to seem like a strange question, but how big is each tortilla? I’m currently living in Germany, and tortilla choice here is not good! I’ve got one option, but I just want to check the size of the tortilla you used. Hi Lisa! I understand! When I lived in Italy making anything ethnic was always a challenge. The tortillas I used were 6-inch, but any size would do! Thanks! The tortillas I got are 9 inches, so I’ll keep that in mind with the portion size. This looks great! I have been looking for an easy, homemade enchilada sauce. I made these for dinner last night. They were easy and took one hour-ish from start to finish. We didn’t miss the meat which says alot and I used whole wheat tortillas from TJs (big deal for me :-)). Even my 4 year old liked it! We love our food saucy so next time I will double the sauce. Thanks for posting. Chelai: Glad you enjoyed the enchiladas! I agre, the sauce is wooonderful, and the veggies are seasoned so well that you don’t even miss the meat! I’m going out of town for a few days and asked my husband what he wanted me to make in advance for him (otherwise he’d end up eating either nothing or something horrid from a drive-thru), and he proclaimed, “Enchiladas!” I have homemade enchilada sauce in the freezer (from the last time I made these) so it’s an easy request and I know he’ll eat well while I’m gone. Such a great, healthy recipe! I use more bell pepper and zucchini and less corn and black beans and top with lots of avocado and cilantro – so delicious. Thanks for another great recipe! This recipe is perfectly timed with the summer produce that will become bountiful and at its best here within the coming months. When your produce bin is over-stuffed with sweet corn, zucchini, and bell peppers…this recipe is your answer….